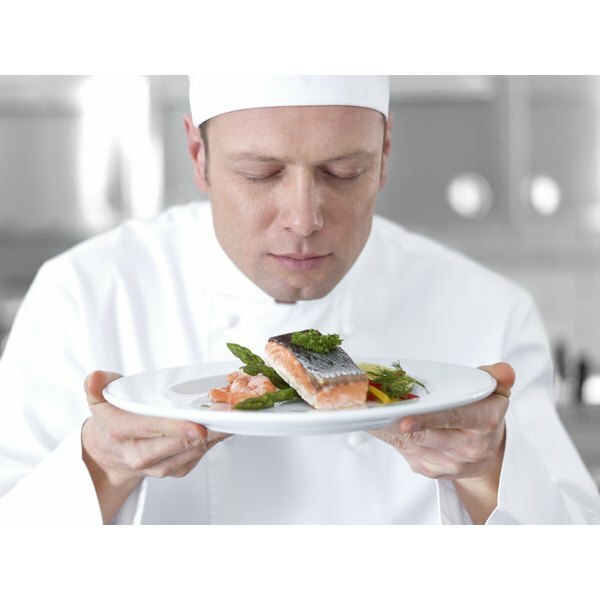 A chef prepares wild salmon for a meal. Wild salmon is low in fat, high in protein and full of vitamins and minerals. There are different varieties of salmon, and it can be either farm-raised or wild-caught. Wild salmon has less fat than farm-raised salmon, and it is higher in heart healthy omega-3 fat. Eat grilled salmon on its own, and use any leftovers to add protein and healthy fat to salads, or to make salmon salad sandwiches. There are two main classifications of salmon--Atlantic and Pacific. While Atlantic salmon has only one species, Pacific salmon has fives species: chinook, sockeye, coho, pink and chum. Species differ in color of flesh and fat content; for example, chinook and sockeye contain more fat than pink and chum. Most Atlantic salmon you can buy is farm-raised and comes from all over the world. Pacific salmon is usually wild-caught and comes from Alaska and the Pacific Northwest. Wild salmon, especially chinook and sockeye, are very high in omega-3 fatty acids. Omega-3 fatty acids are essential fatty acids that the body cannot make on its own. They are necessary for normal brain function and also proper growth and development. According to the American Heart Association, omega-3 fatty acids promote heart health by lowering blood triglycerides and preventing the accumulation of plaque in blood vessels. A 6-ounce serving of wild salmon provides 2.4 grams of omega-3 fatty acids. Vitamin D is necessary for many important functions in the body, and yet there are very few naturally occurring food sources of it. Salmon, especially the sockeye and chinook varieties, are very high in vitamin D. A 6-ounce serving of sockeye salmon provides almost twice the amount of vitamin D recommended by the Food and Nutrition Board to ensure nutritional adequacy. 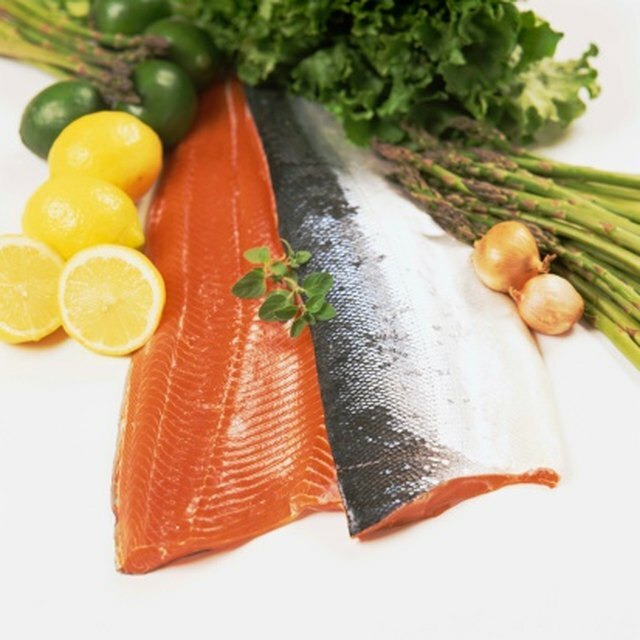 Another important nutrient provided by wild salmon is selenium. Selenium is a trace mineral that works with other vitamins to prevent oxidative stress. Selenium is also necessary for thyroid function and is an integral part of several systems in the body that defend against cancer. A 6-ounce serving of wild salmon provides more than 100 percent of the recommended daily amount of selenium. Wild salmon is a very good source of vitamin B-12. Vitamin B-12 is essential for proper nerve function, red blood cell production and DNA synthesis. A 6-ounce serving of wild salmon provides more than two times your daily vitamin B-12 intake requirements. What Types of Foods Are Rich in Calcium Besides Milk & Cheese?